RACE PARTY takes guests into the fast lane, testing their skills in a high speed arena of slot car action. bringing the charm and nostalgia of slot car racing roaring into the modern era. 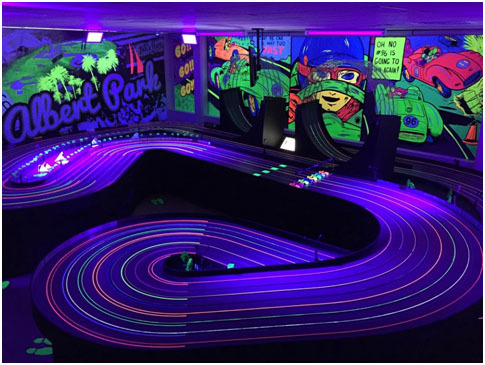 Perfect for all ages from 6 to 106, guests compete on state of the art slot car tracks. Our tracks are 40 metres of twists and turns, consisting of 8 lanes and two 360 degree loops. Take the controls and manoeuvre your car into the lead to take the chequered flag. You simply have to try it for yourself! RaceParty has been featured on national television and in major publications numerous times and is fast emerging as a national, and we like to think, global brand. We are proud to have created this wonderful brand and we are always looking for like-minded people to share in its success. So if you have a passion for people and are looking for a fun and vibrant investment, check out the following information on a unique business opportunity with a strong cashflow, and opportunities to own profitable RaceParty facilities in Australia and overseas. If you already own a childrens / family entertainment centre or a visitor attraction then you will be pleased to know that you can tailor an individual RaceParty attraction to suit your existing venue. CONSIDERing A RACE PARTY License? Come in and feel the rush! To help you understand the brand we recommend you visit RaceParty. Watch how it operates, how it feels, and how very much our guests enjoy themselves. Talk to staff members about their experience of working for us and dealing with the general public. Gain an appreciation of why strong communication and people skills are required in a RaceParty environment. Complete an Expression Of Interest Form and a Confidentiality Agreement. This information will provide us with useful background information on you and your commercial experience and enable us to discuss the RaceParty business opportunity with you openly whilst protecting commercially sensitive information.